Corgi Lab Mix - A Complete Guide To The Corgidor! Home Breed Information Corgi Lab Mix – The Corgidor! Corgi Lab Mix – The Corgidor! Love Labs, But Find Them A Little Too Big And Bouncy? Then You Might Well Be Considering A Corgi Lab Mix! But Before You Pick Up Your New Pup, You Need To Know What To Expect. In Terms Of Health, Temperament And Care For This Mixed Breed. Guess what a puppy with Labrador and Corgi parents is called? If you guessed the “Corgidor,” you are right! And what a cute name for this adorable and loving hybrid dog! Or maybe you chanced upon an adorable Corgidor on social media and became instantly smitten. However you discovered Corgidors, this article will help you learn everything you need to know to decide if the Corgi Lab mix dog is the right companion canine for you! 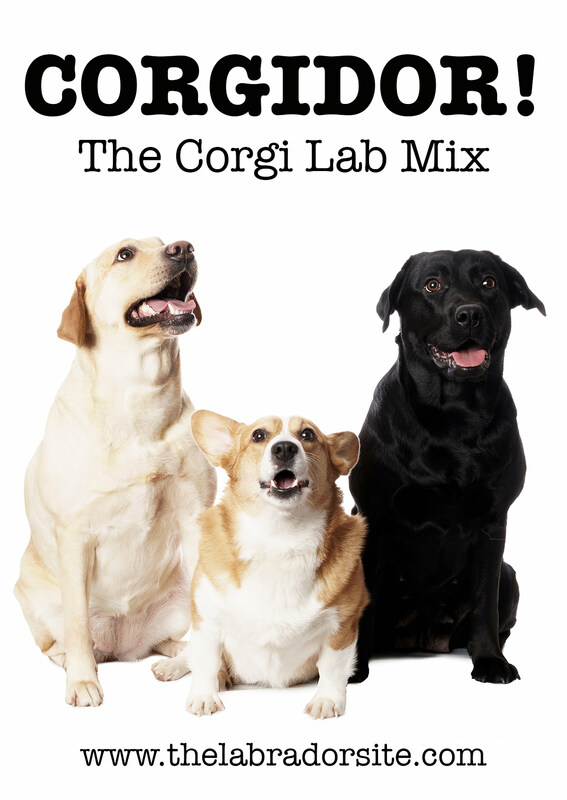 The Corgi Lab Mix has one parent that is a Labrador Retriever and one parent that is a Welsh Corgi. To understand this cute mixed breed, let’s take a look at her parents. There are two similar purebred Welsh Corgi breeds, the Cardigan and the Pembroke. The two Corgi breeds are distinguished mainly by tail length, size and temperament. The Cardigan Welsh Corgi is slightly taller and heavier with a longer tail and a more active personality. The Pembroke Welsh Corgi is more petite and compact with a bobbed tail and more subdued personality. Corgis suffer from a conformational defect that makes their legs disproportionally shorter than their spine. It’s a form of dwarfism and a corgi lab mix may inherit the genes which cause it. Both Welsh Corgi breeds are now officially recognized by the American Kennel Club (AKC) as separate purebred dog breeds for show purposes. If any purebred dog breed deserves to be named the ultimate family pet dog, the lovable and loyal Labrador certainly is it! And in fact, the Labrador Retriever has remained in the number one position on the AKC’s most popular dog breed list for 26 consecutive years! The Labrador Retriever, or “Lab” for short, has three main coat colors. Yellow, black and chocolate. They can come from either show or working lines, and are referred to as English Lab and American Labs respectively. English Labs tend to be larger, with a heavier build and more square head. They also tend to be more playful than their working cousins. But both make great family pets in the right active homes. The Welsh Corgi is a medium build purebred dog, typically weighing between 26 and 38 pounds. Here, it can be important to know whether the parent on the Corgi side comes from the Pembroke or the Cardigan line, since Cardigan Welsh Corgis can outweigh their Pembroke peers by as much as 10 pounds in adulthood. Labradors, on the other hand, will weigh anywhere from 55 to 80 pounds. They also stand a full foot taller than either Corgi breed. So your Corgi Lab mix puppy may grow up to weigh anywhere from 30 to 60 pounds depending on the Corgi parentage and the distribution of genes from both parents. In the same way, where a Welsh Corgi may stand anywhere from 10 to 13 inches high at the shoulder, a Labrador typically stands from 21 to 24 inches high. So your Corgi Labrador may take after her Corgi parent or her Labrador parent, making adult height and weight a big question mark until she actually grows up! 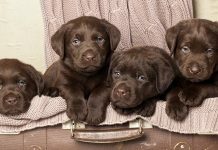 Yellow, chocolate brown and black are the three main Labrador Retriever coat colors. Welsh Corgis, on the other hand, typically display color patterns rather than a single solid color. Pembroke Welsh Corgis have four main color patterns. These include sable/white, red/white, red-head/tri-color, black-head/tri-color. Cardigan Welsh Corgis have six main color patterns. These include merle patches, brindle/white, sable/white, black/white, red/white, blue merle/white. Given this variety of possible parent dog colors, you can imagine how a litter of Corgidor puppies might have plenty of color variety as well! For instance, in a single litter, you might see a Corgi yellow Lab mix, black Lab Corgi, chocolate Lab Corgi mix, brindle Lab Corgi mix, sable Corgi Lab mix and many other color combinations. 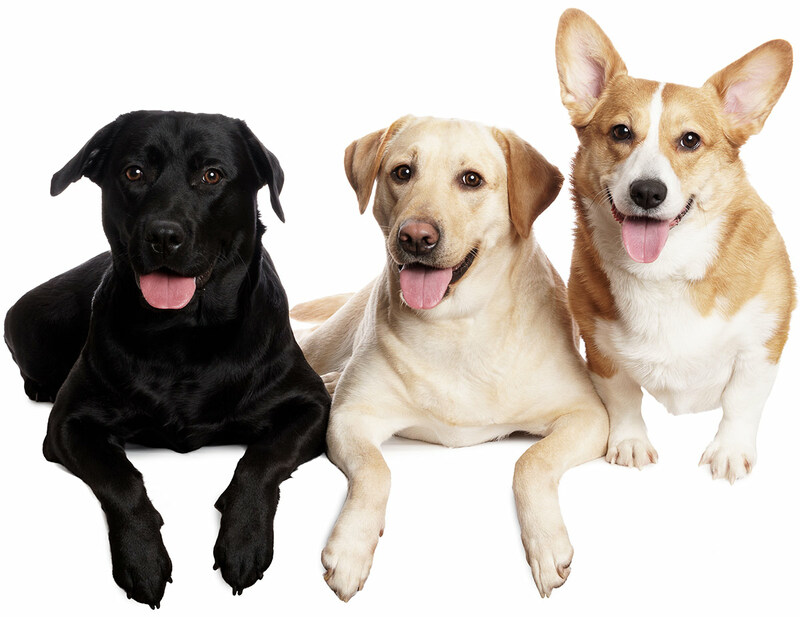 But whether you end up picking a black Lab Corgi mix, or a yellow or chocolate or sable or red or mixed color puppy from the litter, you can rest assured your puppy will be completely unique in coat coloration! If there is one area where the Welsh Corgi and the Labrador Retriever are completely in sync, it is in coat shedding. Both purebred breeds are known shedders and both will shed year-round. Both also require at least once to twice weekly brushing to keep the shedding manageable and help maintain the coat. Since both parents also have short to medium hair coats, your Labrador and Corgi mix puppy will also have a short to medium hair coat. 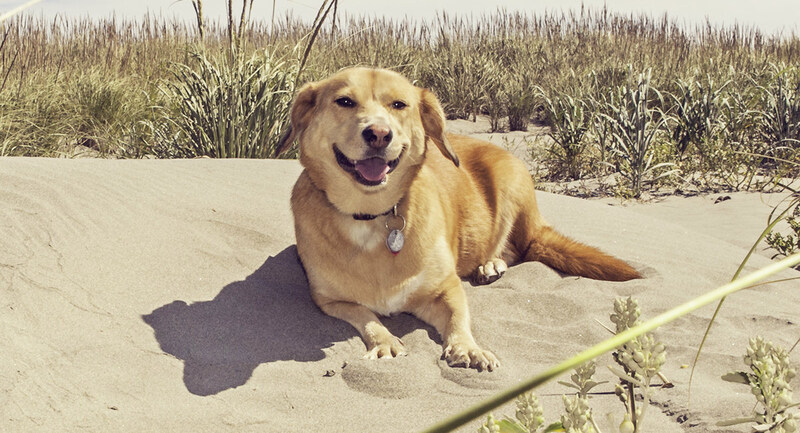 Your Corgi Lab mix may like to swim, since both Labs and Corgis enjoy the water and both have waterproof insulating undercoats. In this case, you will also need to bathe your puppy after every swim to remove all of the chlorine, which can damage the coat and irritate your Corgidor’s skin. If your Corgi and Lab mix dog takes more after the Labrador side, he will be more likely to lick a stranger to death than to do any real guarding! These loving, loyal, affectionate dogs aren’t the number one family pet dog for no reason. Welsh Corgis however can be more protective, territorial, high strung and even aggressive. With Pembroke Welsh Corgis in particular being as known biters when they don’t get their way. The tendency to bite, especially at moving objects, may stem in part from the Corgi’s origin as herding dogs. In this capacity, Corgis were trained to nip at the heels of cattle, sheep and other livestock to get them to move. Barking frequently is another Welsh Corgi trait that may be a holdover from their working dog history. However, neither barking nor biting makes for particularly desirable temperament traits in a pet Corgidor, especially if you have other pets or young children in your family. Here, careful screening of the parent dogs and the breeder’s lineage can help select a Corgidor puppy with the lowest chance of exhibiting either trait. Regardless, socialization is essential with a breed with these traits, to make sure that they are happy with strangers visiting the home. Even when it’s a mixed breed, as you don’t know how their adult personality will express. Make sure you have daily visitors to the home when you get your puppy, and keep introducing them to new people and places from 8 weeks to 14 weeks old. From this point regular encounters will still help, but the socialization window will have begun to close. This is why it’s important to dedicate yourself to your puppy’s familiarity with strangers during these early days. Many people who see a Welsh Corgi for the first time are struck by how short this dog’s legs are in relation to its body length and width. Short legs notwithstanding, Welsh Corgis love to stay active. These dogs are working dogs at heart, and they can maintain high levels of physical activity for hours upon end without tiring. This includes swimming as well as land activities. 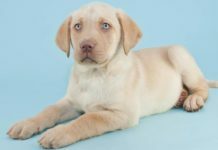 The same holds true for the Labrador Retriever, which was originally bred to be a hunting dog who could flush, fetch and retrieve with the best of them. Like Corgis, Labs also love to swim. So you can expect your Corgidor hybrid dog to be an active dog, with a high need to stay busy at a job requiring lots of physical activity. If a daily active job is not available, your Corgidor will look to you to provide appropriate alternatives, which may mean long walks, hikes or runs and plenty of interactive games of fetch and Frisbee. However, it is sensible not to encourage a Corgi cross to jump, due to the increased risk of intervertebral disc disease. And that’s not the only health problem these pups have to worry about. The Canine Health Information Center (CHIC) maintains a breed-specific database for most purebred dog breeds. Breeders can register their sires and dams on a voluntary basis and contribute information about genetic health issues. CHIC for Cardigan Welsh Corgi. The following lists include known heritable genetic health issues for both Labs and Corgis (Pembroke and Cardigan). However, keep in mind that it is never possible to list all possible health conditions that may occur in the future. 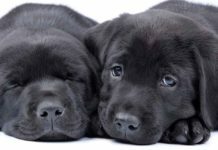 Labradors are predisposed to several health problems. Some of these you can health test for, and your pup’s Lab parent should have as a minimum good hip and elbow scores, PRA clear and an eye test from within the last year. Patellar luxation Dislocated knee cap. Canine hip dysplasia (CHD) Caused when the hip joint fails to develop properly. Osteochondritis dissecans (OCD). Elbow and shoulder dysplasia caused when these joints fail to develop properly. Distichiasis Eyelash disorder that causes stiff eyelashes, ticks, twitches, corneal ulcers. Entropion The eyelid develops so it folds inward, causing eyelashes to rub against the cornea. Retinal dysplasia The retina develops with folds or lumps rather than smoothly. Cataracts The eye lens becomes partially or completely cloudy. Central progressive retinal atrophy (CPRA) A progressive retinal degeneration which eventually causes blindness. Exercise induced collapse Associated with a Dynamin-1 gene mutation that causes collapse after 5 to 15 minutes of exercise where stress, extreme heat or excitement is present. Centro-nuclear myopathy A type of canine muscular dystrophy that causes persistent weakness in muscle fibers. Often resolves after the first 12 months. Hypothyroidism Low metabolism caused by underactive thyroid gland. Hot spots Also called moist eczema, hot spots occur when bacteria penetrates the skin to cause lesions, rashes and excessive heat. Tricuspid valve dysplasia Congenital valve malformation that can cause congestive heart failure. Diabetes As with people, canine diabetes occurs when the body cannot produce sufficient insulin to regulate blood sugar levels. Your pup’s breeder should be open and happy about discussing the parent’s family history and health. If they seem evasive when you ask about any of these issues them walk away and find another litter of puppies. As a minimum the Corgi parent should have been x-rayed and confirmed clear for IVDD, be PRA clear, have good hip scores and a clear eye test carried out within the past year. Corneal dystrophy Abnormal deposits form on the outer surfaces of the corneas. Cutaneous asthenia (Ehlers-Danlos syndrome) “Weak skin” caused by low collagen levels. Degenerative myelopathy Progressive spinal disease causing loss of control over hind quarters. Familial nephropathy Renal (kidney) disease that causes progressive renal failure. Intervertebral disk disease (IVDD) Degenerative disease affecting the soft cushioning pads between vertebrae. Persistent pupillary membranes (PPM) Fetal tissue strands on pupils fail to dissolve after birth. von Willebrand’s disease Type of hemophilia that affects clotting ability of the blood. Progressive retinal atrophy Ongoing degeneration of the retina that leads to blindness. Retinal pigment epithelial dystrophy (RPED) A type of retinal atrophy affecting the outer retinal layer. Urolithiasis Bladder stones caused by excess uric acid. Patent ductus arteriosis A congenital defect where a large blood vessel doesn’t close after birth. Primary lens luxation (PLL) The lens in the eye dislocates, causing pain and eventually blindness. If this seems like a lot, then you’re right. Though it’s true that every pedigree breed has health problems that can impact them. The important thing when considering a hybrid from two different purebred parents, is to ensure that you have proof of both of their relevant health tests. This way you can reduce your chances of having a puppy that is affected. The Welsh Corgi has a typical lifespan of between 10 and 13 years. The Labrador Retriever has the same typical lifespan of between 12.5 years. It is realistic to expect that a Corgi Lab mix puppy would live a similar amount of time. Possibly a little longer as small, mixed breed dogs do on average have slightly longer lifespans. As you can see from the list of heritable health issues outlined here, it is vital to choose an honest, reputable breeder. 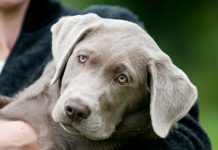 In particular, you will need to be sure the breeder willingly permits you to meet and interact with both parent dogs so you can learn more about their temperament, health and genetic backgrounds. Is open and honest with you about all known heritable health issues in the lineage. Volunteers proof that both parent dogs have been tested for eye, hip and other known genetic issues and have passed the tests. Permits you to meet and spend time with both parent dogs. Provides you with proof of all required vaccinations and any genetic testing done. Gives you an initial guarantee of health lasting at least 6 to 12 months. Agrees to take the puppy back if things don’t work out. Volunteers to provide you with client references and testimonials. Meeting the Corgi parent is essential, even if they are the stud dog and not the mother. Even if you need to go to another property to visit them. This is because temperament can be passed down. Meet the Corgi parent and ensure that they are relaxed in your company, not snappy or aggressive. Because of the height, weight, color, health and temperament differences between the two parent dogs. It is impossible to predict which traits from either parent will show up in a particular puppy from their litter. 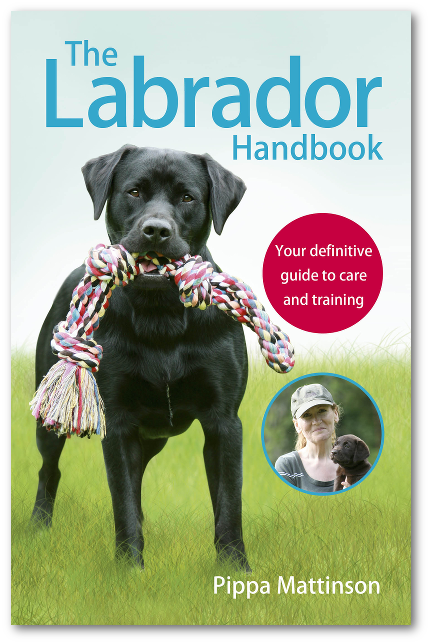 Many of the heritable health conditions associated with both Labradors and Welsh Corgis are serious, long-term conditions requiring ongoing and expensive veterinary care. Some of the most serious heritable health conditions can also be severely life-limiting or fatal. While genetic testing won’t predict personality and temperament issues, for these you can spend time with both parent dogs and get a feel for how their traits may show up in a puppy. 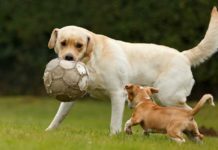 There is a way to ensure you get a Lab Corgi mix breed dog without encouraging the production of dogs that suffer from dwarfism, and that is to adopt rather than purchase a puppy from a breeder. When you choose Corgi Lab mix adoption, you will most likely be adopting an adult dog instead of a puppy. 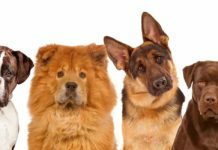 Depending upon their age, this can also be a good way to ensure your dog has not inherited certain early onset genetic health issues. Also, you can get a much better sense of your Corgidor’s temperament and personality and steer clear of undesirable traits such as biting, excessive barking or aggression. But most of all, when you rescue a Corgi Lab mix, you give a displaced dog a new “forever home” and a fresh start in life, and this can feel so good for you both! Is a Corgi Lab mix the right dog for me? There is no doubt that Corgidor puppies are endearingly cute. But your goal is to look beyond puppy cuteness to choose a Corgi Lab mix who can be your canine best friend and life companion! Corgi Lab mixes are not suited to homes with young children, and can have a potentially nasty array of health problems. Hoskins, J.D., DVM, PhD, DACVIM, “Exercise-induced collapse in Labrador Retrievers,” DVM360 Magazine, 2008. Buckland, E., BSc, PhD, et al, “Labrador Retriever: Centronuclear Myopathy,” 2016. McKay, L.W., et al, “Juvenile nephropathy in two related Pembroke Welsh Corgi puppies,” Journal of Small Animal Practice, 2004. Rattner, F., DVM, “Ask a Vet: Corgis Prone to Back Problems,” Capital-Gazette/ South Arundel Veterinary Hospital, 2017.
den Hollander, A.I., et al, “Lighting a candle in the dark: advances in genetics and gene therapy of recessive retinal dystrophies,” The Journal of Clinical Investigation (JCI), 2010. Levine et al 2006 Matrix metalloproteinase-9 activity in the cerebrospinal fluid and serum of dogs with acute spinal cord trauma from intervertebral disk disease. American Journal of Veterinary Research. Next articleLab Pointer Mix – Is This The Dog For You?